I write this post as I am recuperating from one. crazy. work. week. Keeping up with a blog on top of working 40 hours a week is extremely difficult, but as fashion and photography are a few of my favorite hobbies I always make time for my creative outlet! By day I work as an Executive Administrative Assistant at a Medicaid program, and by night I am generally in a pajama shirt, sans pants, on my computer blogging my little heart out. This past month I have been preparing binders (13 to be exact) full of documents from the past 2 years of business. The organization I work for is getting audited by Centers for Medicare & Medicaid Services and in all honesty it would be a fun ‘jelly-bean guessing game’ to figure out how many trees I have taken out with all the printing I have been doing. Thankfully everything has been completed as of last Friday, but you know auditors – they will always ask for 13473984 more things while they are there. While organizational skills at work are relative to the influx of paperwork on your desk, I have found a very easy way to keep my personal affairs in order. It’s a simple two words: Dagne Dover. 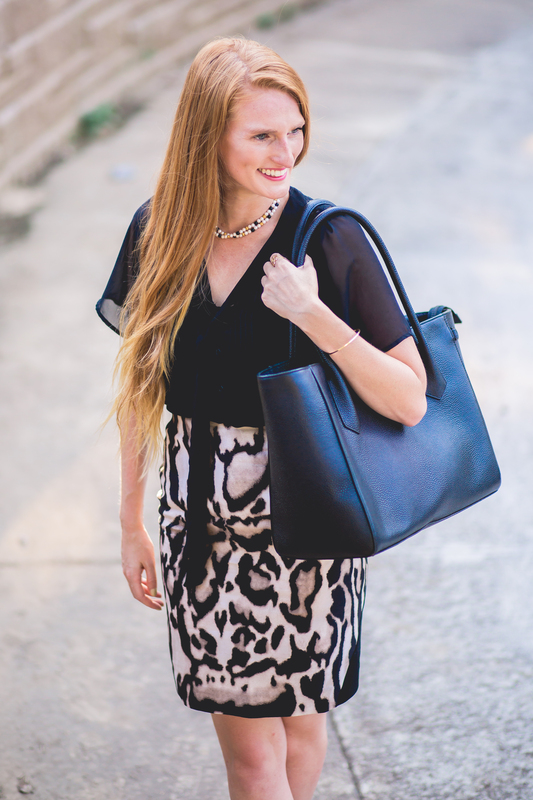 I bring my Dagne Dover 15″ Onyx Stingray tote bag to work everyday. That is not an exaggeration – it literally has my entire life packed into it. Everything has a compartment for itself: from my laptop, to my work ID badge, to my Nalgene. A coworker of mine recently complimented my bag saying she wished she had one as sturdy and structured as mine – one that stands up tall on its own instead of slouching over. I told her about my DD bag and showed her all of the compartments. She was blown away by the amazing quality of the bag, the organizational options it provides and most importantly the effortless-chic look of the bag, which are perfect for any busy woman on the go! 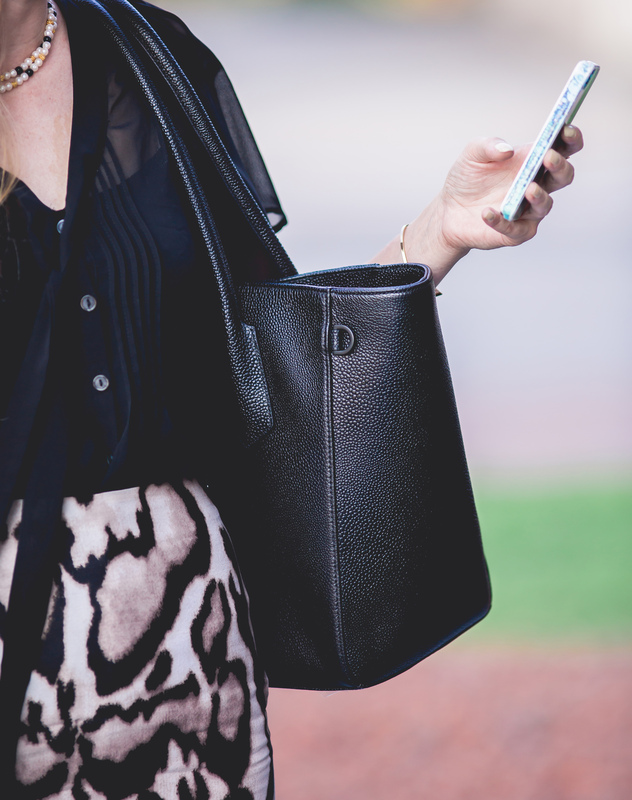 Luckily for her, I teamed up with Dagne Dover and my Style Collective sisters on a GIVEAWAY to win a FREE PURSE! Head over to my Instagram to see how to enter. In addition we have a 20% coupon code off your purchase just in case you don’t win the giveaway – STYLECOLLECTIVE20. Below I am sharing a few tips on how to keep your work bag organized and the essentials you need in your bags – always! Photography by Matthew Wonderly. “A Place for Everything, Everything in its Place” – You don’t know how many minutes of my life I have spent watching my mother fish around her floppy purse looking for her keys to the house. I’d stand there and tap my foot, frustrated that she couldn’t magically snap her fingers and the keys would appear. My first tip is to always put your main items in the same compartment of your bag every single time so you never misplace them. Put your keys in the left pocket, put your wallet in the zip compartment, and put your train pass in the phone slot behind your phone. This will make everything easy to grab and once you are in a routine of putting things in the same place, you won’t even blink an eye as you go to reach for that item – it will ALWAYS be in the same spot! One of my favorite features of the Dagne Dover bags is the key chain they have. It’s an attachable chain that you connect inside of your purse so one tug brings your keys right to your hand! Color is Key – Picking out a color of a purse is one of the hardest things to do while shopping. You want to make sure it’s a color you can wear across many seasons and is easy to match with your outfits. 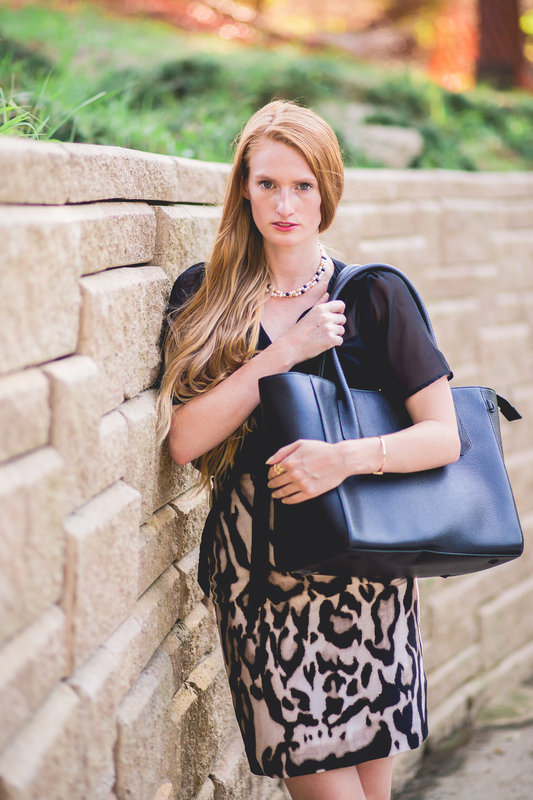 With Fall/Winter coming up, it was a no brainer for me to chose the Onyx Stingray bag by Dagne Dover. One of my favorite things about the Dagne Dover bags are that they have the best solid colors to chose from. I have a black one, a tan one, and a baby blue one. The prints and textures are fun and beautiful as well, but for me I stick with solid colors so matching and having a true everyday bag is easier. My second tip is to choose a neutral color for your everyday purse: black, tan, navy, ivy green, white or brown. These colors are versatile with many outfits and can transition from season to season effortlessly! A Bag that Means Business – As we all know, first impressions are everything. From the work outfit we wear to the strength of our handshakes – we are being judged from the exact moment we meet someone. As strong, intelligent and goal-driven women having a bag that reads the same vibes is extremely important. 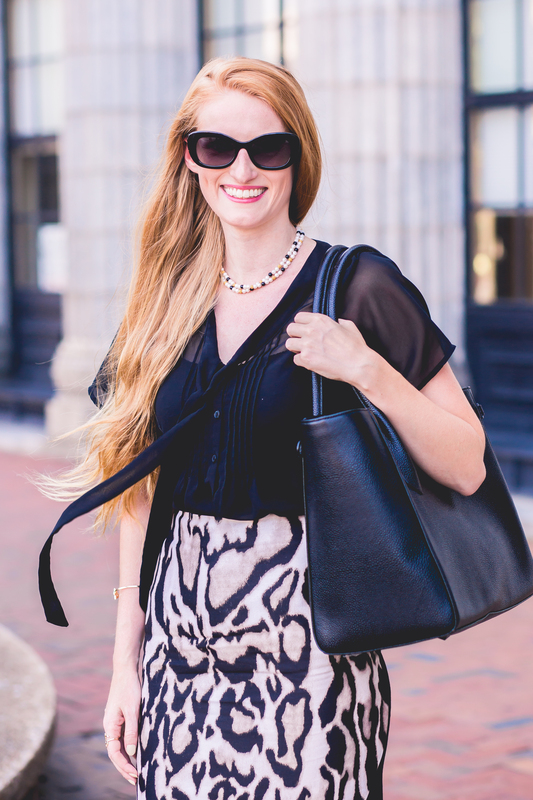 My third tip is to invest in a tote bag that looks as professional as you are! You don’t want to be leaving the office and bump into someone with a saggy, crinkly bag that has makeup explosion stains and that bag of chips from 2 weeks ago in it. 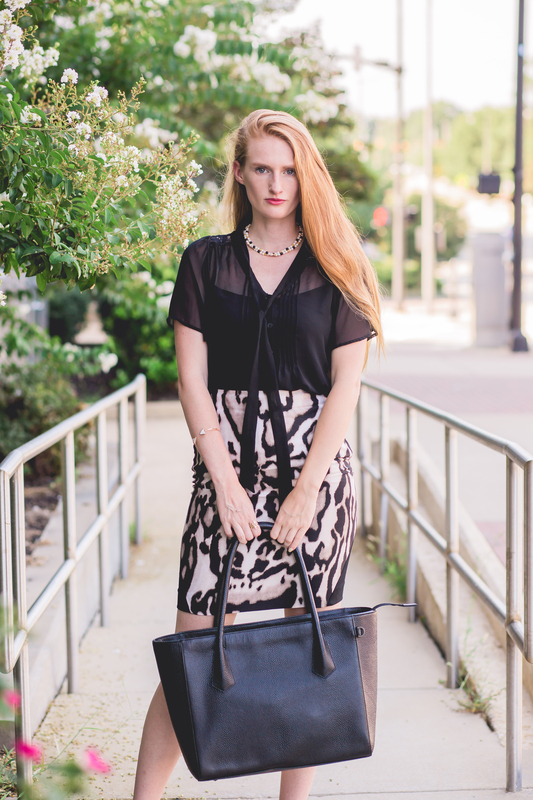 A structured bag is not only the perfect accessory for the organized and driven women, but it is also gives a professional and put-together vibe. A Dagne Dover bag will make you look even more professional, and more importantly they will make you feel more professional – instantly boosting your confidence! Bag Lady – Being a bag lady is NOT a bad thing! In fact I love bag ladies because they are kind of like Mary Poppins and can whip anything out of their purse from Neosporin to an extra tampon. With Dagne Dover’s many compartments I have achieved my bag lady goals into one single purse. Instead of having to cary multiple bags, I can fit everything I need into one bag. I have a hydration station, first aid kit, work supplies, pens, lipsticks and room for more! My 4th tip is to always keep these essentials in your bag: a pen, bandaids, Advil, extra feminine products (for yourself and a sister in need – you always want to be that girl to help someone out! ), a small notebook and a shade of lipstick! Embrace the bag lady, you know you want to. In the comments below share your professional and organizational tips! Thank you Dagne Dover for sponsoring this post! Wow …very stylish … I need one … and I love to be organized !!! I LOVE that bag! I have been wanting one for so long! These pictures are stunning! Keeping things in their place in a bag is a struggle for me, but I know it helps so much! Love how professional this one looks to be! Sounds like you need a Dagne Dover bag 😛 Thanks for stopping by Emily! Taylor you look like an executive at some major company in this post girl!!! You are SLAYING HARD!! 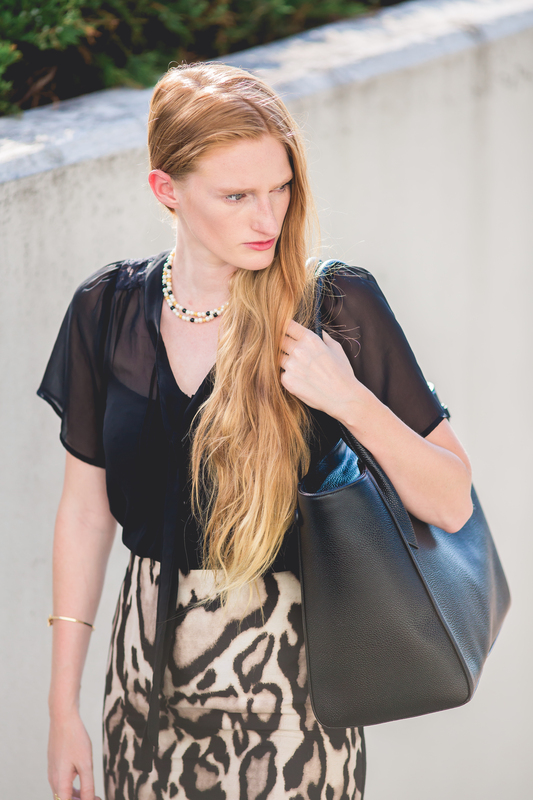 Love the bag and the tips that I can use for sure and the way you dressed for work!! Get it girl!! Ruthie you sure know how to make me feel confident and amazing! I can totally see you rocking this look, the skirt would look BOMB on you! Cheers to girl bosses! Great tips! And I have the sand DD bag but i am loving this one! I have the linen Mini tote as well so we are totally twinsies! Thanks so much for your comment Amanda. I have been eyeing those bags for a while! They are so cute and functional! You look gorgeous! I say pull the trigger! I love mine and use them daily, and also for travel. Oh girl I am starting to work a full time job again soon – We need to discuss how you balance life! Because I am super nervous and want to make sure the blog still continues to grow and represent me. I loved these tips and organization is so so key! Congrats on the new gig. You da best! Honestly I don’t know how I do it, haha! My life is so crazy and sometimes I have a hard time keeping up with my blog, but I always remind myself how much I love it and how rewarding it is. I usually shoot on the weekends and do my flaylays after work. Good luck with the balance, it’s hard but doable! That bag is so cute and it looks like it’s the perfect size for work! I love finding chic work bags. Same here! 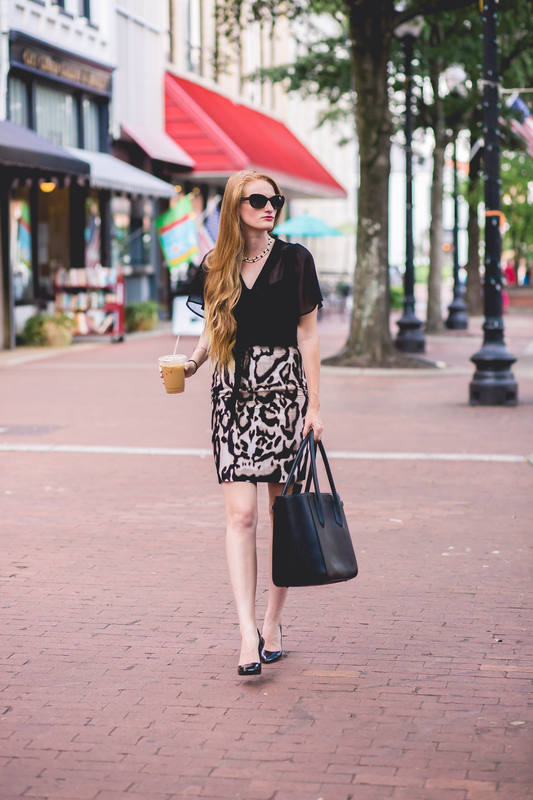 Structured and business-savvy, Dagne Dover has it all! You are looking so chic and fierce Taylor!! Love your work outfit. This bag sounds like a magical Mary Poppins for sure. I could definitely use some organization in my life haha. Hope you’re doing good! Your tips for staying organized are terrific. It’s always easier to be organized with the correct tools. Dagne Dover nails it. These photos are to die for. ! Every single one of them is just perfect. You are such a natural beauty. Go get ’em. !! Gail you NEED a Dagne Dover bag! I swear every woman needs one. Thank you so much for your sweet comment. I don’t always get this dolled up for work, but when I do I feel like a total girl boss! I bet getting audited makes your work week interesting! Way to hang in there girlie. The bag looks so office friendly! And black is such a classic color! Well I can say it hasn’t been TOO crazy! The hardest part is not stealing the doughnuts and coffee that are left out for the auditors, haha! 😛 Thanks for your comments Anna! Wow that is a great bag. I hear you I work in publishing and work 45-50 hours a week and then maintaining a blog full time on top of that. It is exhausting. But I have recently discovered photography and I love it. I bought an f1.4 50 mm lens and it takes great photos but learning to focus with this lens does take some getting use to. You are in NY? I am too, we should get together for drinks or something. I will check out your photography. The hustle is REAL girl, I totally feel you! I love getting new lenses and that one is a fabulous one to own. Fixed lenses aren’t my favorite because I’m a total zoom person, but the quality of the pictures is priceless! I am not in NY but will be back in September for NYFW, would love to link up! Thank you so much Lilith! Taylor! You look SO polished and gorgeous girlfriend! 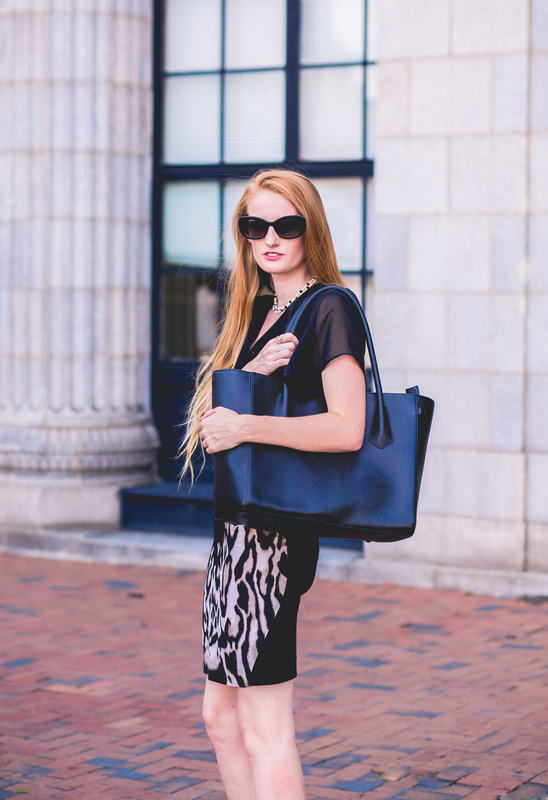 I love the clean lines of this tote, and your tips are perfect! Especially your “A Place For Everything, Everything In It’s Place” tip! I live by that rule in my home, office, and car… but unfortunately my work bag doesn’t always reflect it, lol. Great post idea! And I am loving the animal print on you… simply fabulous! Heather you are so sweet! Thank you so much for your kind words. Doesn’t it make life easier to always put things in their place? I understand it’s hard to keep all aspects of life organized, but we all owe it to ourselves to make life that much easier. Total life hack tip right there! GIRL! YOU SLAY THAT WORK LOOK! This bag looks like everything I need in a day-to night purse, and love the organizational qualities this brand offers! Perfect year-round color too! That blouse is the best! These are such great tips! I think a great work bag says a lot about a person! I LOVE that bag and have been dying for one! Totally agreed! Thanks for stopping by Jessica! Thank you so much! I love this skirt so much. Since you are petite I totally get that! I would not recommend this bag for short or petite girls. The Dagne Dover mini tote is perfect though and I highly recommend it 🙂 Thanks so much Yulia you are so sweet! Hi Taylor… I had to stop by and throw in my two cents here. First I’d like to say it’s amazing to get to know you outside of iger. I too work a full time job as a supply chain specialist on top of blogging and writing books. But I love what I do and enjoy meeting others who can understand the lifestyle. You look amazing and your tips are right on point. 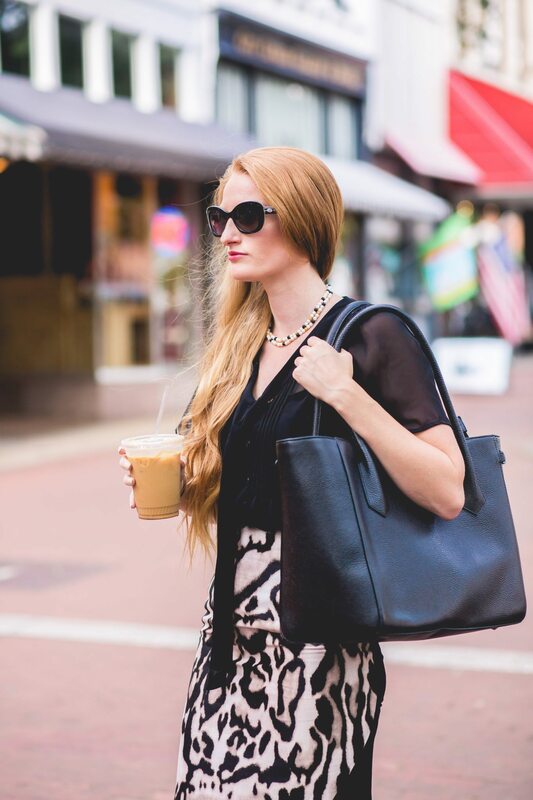 I carry more black bags and neutral colors such as silver, gold, and blush pink so I can have one to go with every outfit. Thanks for sharing and I’ll see you on Insta! I’m glad I have another girl boss to lean on! It’s so hard balancing a blog and work, but it’s comforting to know other women do it too! We should start a support group or something HAH! Much needed because sometimes I swear I’m going crazy. But it’s so worth it! I so love your office ootd! That bag truly sounds amazing and I think it would be well worth the investment. Thanks for all the awesome tips lady! Also, just wanted to let you know how much of a total girl boss you are for crushing at both blog and work!!! Every one needs a great sturdy tote to carry all their important essential. Especially when you are constantly on the go. What strikes me about this bag its such a great price point and it will help keep you organize. Such great points! I agree, the bags are definitely worth the price. My coworkers I mentioned in this post brought her new Dagne Dover in today and she couldn’t be more pleased! So gorg Taylor! You stun in these photos. 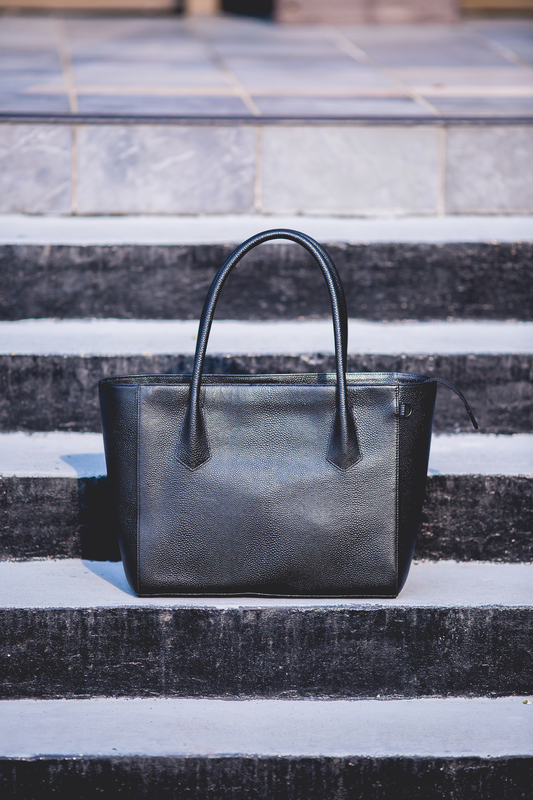 This work tote is so chic, love it. Definitely checking it out, thanks for the share. Christie! Thanks for the love – DD is the best! Great style! 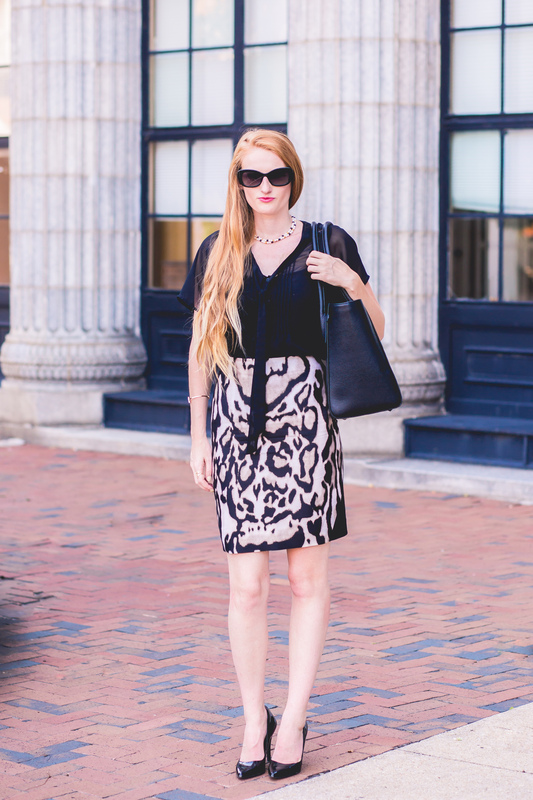 Love black and animal print and this combo looks perfect on you! Thank you! I am slowly getting into leopard print. I like it in small doses! 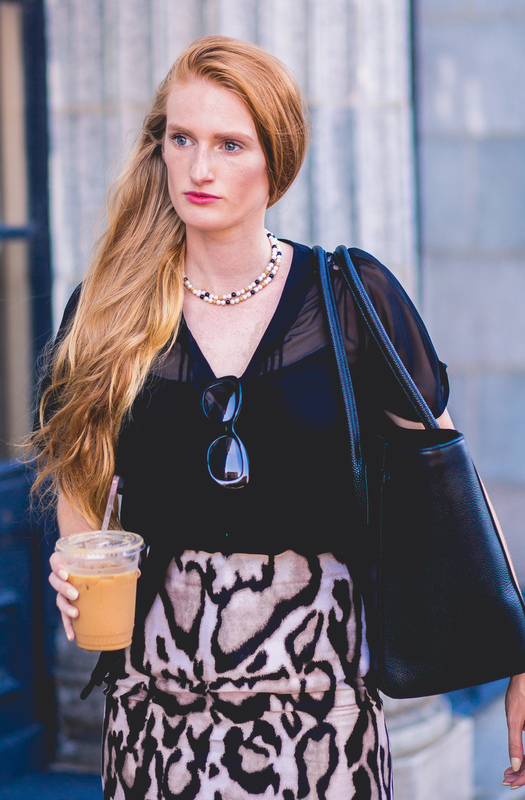 And with this DVF skirt I couldn’t help myself, it’s so fierce. Thank you so much Carolin! I’d love to connect on social media. Same here, but this skirt is to die for! Beautiful! And great tips 🙂 I hope you have a great rest of your day! Great post and love the skirt. so chic! Thank you Maryam, it’s my favorite to wear to work! Thank you so much! You would love these bags! such a chic look! loving that skirt! Is no one else’s Dagne Dover slouching to one side after using it a while?? Mine hasn’t slouched! I just make sure it’s always propped up and/or leaning against something so it’s always straight. I’ve had mine for about 3 years and it’s still standing tall without slouching!